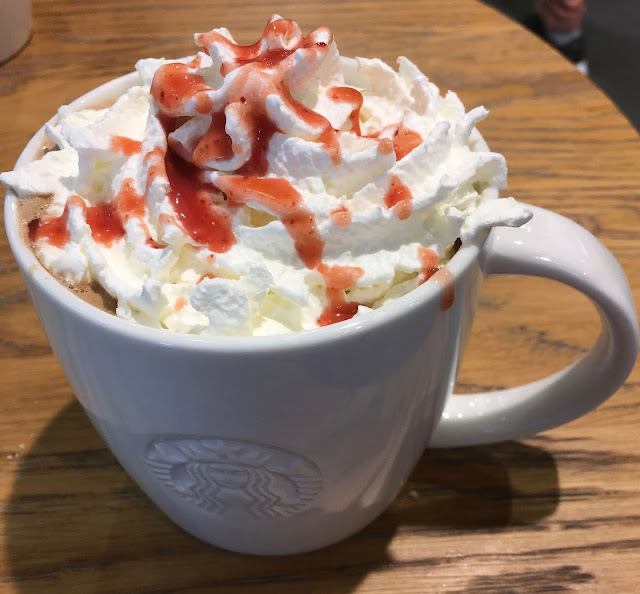 What better way to end the year than relaxing with a soothing hot drink, and so I decided to treat myself to something nice from Starbucks. This is the end of the seasonal menu for them, with the New Year beginning tomorrow I can’t imagine the menu being around much longer. Rather than my brain being set to January = Health, Im still on December = Indulgence, so what the heck I ordered a Starbucks Candy Cane Mocha. The drink comes topped with cream, and strawberry sauce, the mocha itself is flavoured with peppermint. The picture on the board shows the drink looking spectacular in a glass mug, but in store they serve it in a pottery mug. I know they needed the red sauce to look like candy cane stripes, but strawberry and peppermint is a bit of a curious combination. I solved this problem by eating the cream first with the sauce, and having the drink second, crisis averted. Peppermint, coffee and chocolate do all work well together and it turns out this drink is one of my favourites of the season. It is a shame to have discovered it so late into December, but it is a drink I will be on the look out for next year! I hope you all have had a good 2018, and that you have a brilliant and Happy New Year!!! We like Biscolata. They are a strange import snack from Turkey that oddly is distributed by a local firm so show up quite a lot. And here is a new one - 50p for a bag of burgers! I mean, 40g isn't much and it's full of poly-un-bad-things but they are actually vegetarian and quite nice. And they look pretty cool too. They have little crystals on the top which add to the variety of textures - other than that they are just a really, really, clever custard creme style affair. I think if this was done by a big brand then they'd be a massive hit, as it stands it's just a little hidden classic that looks like a gimmick but works really well. This is my last beer blog of 2018. It's been a tough year health wise, with the later part of 2018 spent rehabilitating my knee after its second surgery, and I'm sure the first part of 2019 will be spent doing the same. However, I wanted to pick a beer that showed strength and resolve. The Viking leaning on a huge saw on the front of this Ripsaw beer made me think of hard times behind me and stoic determination to succeed. I'll continue to rehabilitate my knee and then work towards a new start. What's you New Year's Resolution? 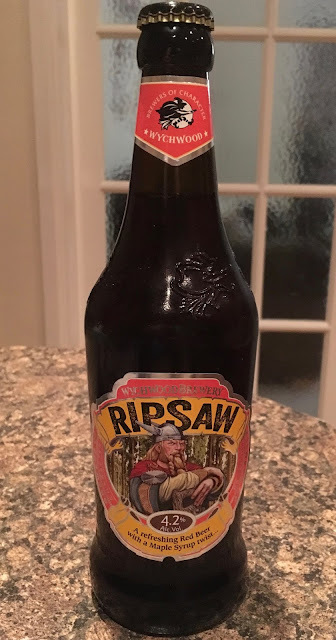 This Ripsaw red beer was produced by the Wychwood Brewery, in Oxfordshire. At 4.2% volume this ale was made with barley and rye (for extra spiciness and its red colour) with a twist of maple syrup. Maple syrup goes well with everything. I've had it recently for breakfast with bacon, on burgers and even more recently flavouring pork crunch (for lunch this afternoon in fact). I'm certainly expecting plenty of sweetness here from the crystal malts, roasted barley and caramalts, and that twist of maple syrup. This Christmas has been a good one, there has been good prezzies and good food, and we still seem to have a cupboard full of treats to keep us going into the new year. Our chocolate yule log this year was the other item I ordered from the Marks and Spencer food order, and this too didn’t disappoint, in fact it stunned. 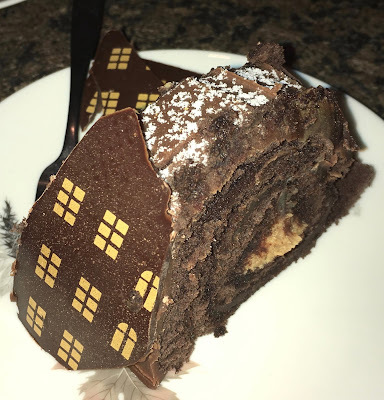 The Santa’s Rooftop Chocolate and Caramel Yule Log is shaped like a city street, complete with buildings and lights, and a sleigh on top, presumably Santa is off down a chimney delivering a present or two. The cake is a chocolate Swiss roll filled with chocolate and caramel ganache. It is a big cake so does lots of portions, but is a little bit difficult to cut because of the solid chocolate sides. The cake is very rich and has a good intense chocolate flavour. The caramel was sweet and rich, but the flavour was very much present. The cake’s sponge is soft and moist and very enjoyable to eat, and the swirls looked pretty. There was a nice crunch too from some caramel crystals that were dotted throughout the cake, this mixed up the flavours and added to the texture. This cake is a heck of a treat, and we all loved it. 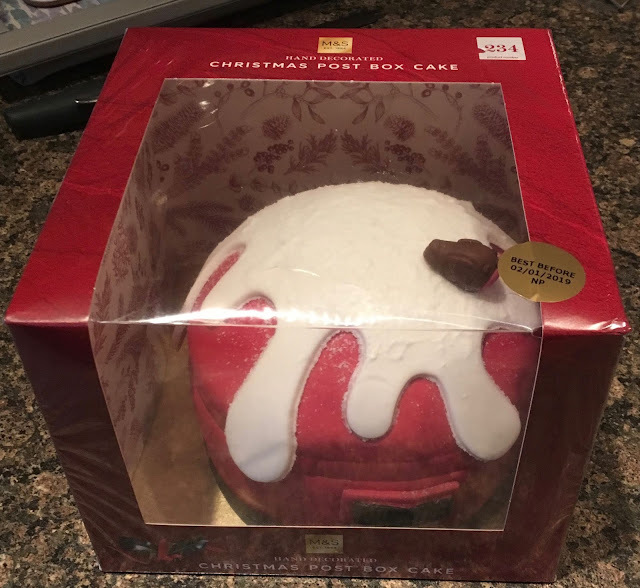 This is definitely one the to keep an eye out for in your local branch of Marks and Spencer, finding it reduced would be a bargain and a great cake for New Year’s celebrations. It was tempting to do this as another video, but with the cold I have you'd not understand a word of it! So - instead - here are a few things that I've been given over Christmas from friends and relatives who are aware of the blog. Here we have a big box of nerds, a smaller box of nerds, two kinds of Oreos (not for dunking), purely orange smarties, shortbread, Raspberry Ripple hot chocolate, home made chocolate slab, and a Lind Santa! Then on the right we have a whole hampers worth of goodies put together by my parents. Firstly and most importantly - a rocky road Santa! We've reviewed my mother's recipes for this before so will save it for later. Choc affair bars, with a Bizzare bar for pudding! We've eaten lots of these, not quite sure which flavours made it to the site. Italian Breadsticks & Olives. That's my evening sorted. Better than chocolate in my opinion! We've been drinking Mr Fitzpatrick's Dandelion & Burdock cordial for a while - this sounds amazing and will likely get it's own review. May be a perfect cocktail base for the tanker load of gin we now own. We like English Tea shop tea, we like biscuits. This seems a good combo. And lastly a nice preserve for eating with the leftovers from Christmas dinner - haven't we done well!! What have we learned? No hot drinks, and everything is better when it's in the sale! I hope everyone has been having a lovely Christmas. Santa Claus has delivered all his presents and I hope you received everything you wanted. 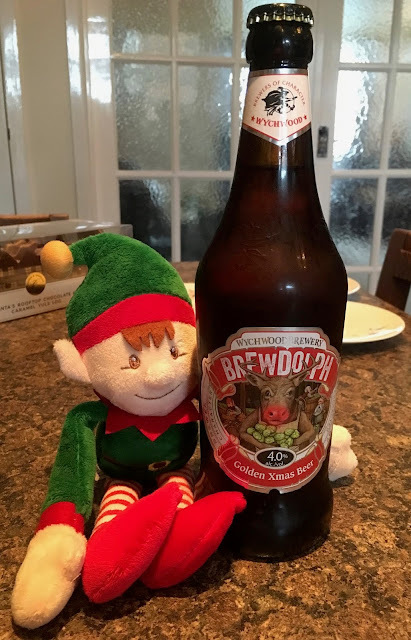 It's pretty obvious how Rudolph gets his (depending on who you talk to and how accurate you want the 'fun' to be) bright red nose from the front of this Brewdolph Golden Xmas Beer, produced by the Wychwood Brewery in Oxfordshire. I've seen a few television programmes lately claiming that at this time of year Rudolph would have fought his antlers off for the affections of his female colleagues, but I prefer the song rather than the possible facts! Here Rudolph is carrying a bunch of hops in Santa's brewery in order to make some more of his namesake golden beer, after drinking all the previous batch once the presents had been delivered (of course). Many people can understand the need for a good drink after a hard day at work (or night pulling a large hairy old man around the world with a vast amount of presents). Although I'm still nursing a poorly knee back to health myself after an operation. I first had to wrestle a cheeky elf for the bottle. On opening this 4% volume golden beer there were aromas of pale and sweet malts, followed by a crisp fruitiness from citrus hops, a touch of pine and yeast at the back of the smell. On taste this golden beer tastes more like a heavily hopped lager. There is a decent fizziness, with plenty of bitter punch from the hops followed by sweetness from the barley malt. It states a "delicate" dry finish on the label, but I'd disagree with that. There is certainly a lot of dryness in the aftertaste that does make this beer unputdownable. I can certainly see why Rudolph drinks each batch so quickly. No wonder he has such a red nose all the time! Having enjoyed our Christmas Postbox Cake yesterday, today I've been tucking into a Marks and Spencer Three Bird Roast. We love the mix of meats in this, and the epic seasoning, the whole kitchen still smells of rosemary. Throw in roast potatoes, stuffing, pigs in blankets and even Brussels sprouts and we were filled to the brim. Although there was a little space for a fruity and rich Christmas pudding and a splash brandy cream! This is just a brief message today to wish you all a very Merry Christmas from everyone at Foodstuff Finds, and we are hope yours has been filled with good food and happiness too. We ordered just a few select items from the Marks and Spencer Christmas food catalogue this year, but they really didn’t disappoint. 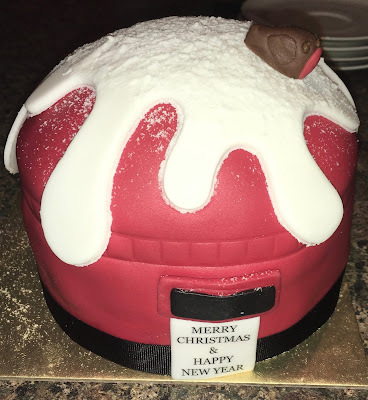 I’m hoping the three bird roast works out well tomorrow, and we have an epic chocolate yule log to test, but the item we tucked into first is this impressive Marks and Spencer Christmas Postbox Cake. The detail on the cake is beautiful, forma the cute robin perched on top of the postbox, to the sweet Christmas message on the front. The cake isn’t a traditional fruitcake though this is an epic Victoria sponge with four layers of vanilla sponge and not to mention lashing of fruity jam and buttercream. Being mostly round the cake wasn’t too bad to cut, we went for cutting it in half and then cutting slices out of it. 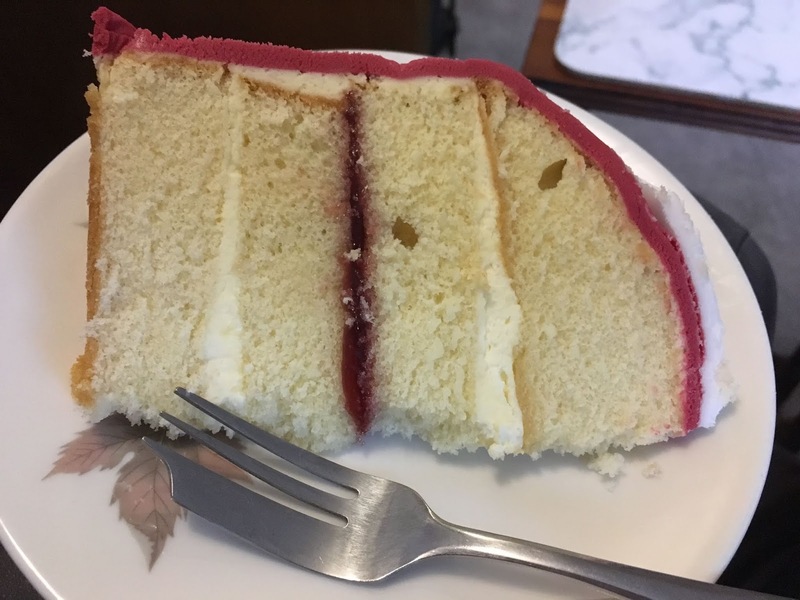 The slices didn’t need to be too wide as the cake itself is rather tall with its four layers. The soft icing was very pretty and added nice decoration, sweetness and texture to the cake. The vanilla sponge was perfect, fluffy, moist and had a good flavour. The buttercream was outstanding, rich and creamy and it was balanced nicely by the berries in the jam. This is statement cake, and it was expensive, but I think it was worth it. It was something very special and it is Christmas. This is the perfect alternative to those who don’t like a traditional fruitcake, and is a proper crowd pleaser for anyone. If there are some of these cakes in store over the next few days I’d recommended picking one up as a New Years treat, fingers crossed that they might even be reduced. Merry Christmas everyone! The final day for some of the calendars - but not all! I think Bahlsen have realised that there is a certain section of the market that don't like food with 'foreign' names. Choco Leibniz is something that I've loved for years - no idea if I first tried them in Germany or the UK, but I've certainly introduced a lot of people to the pleasures of biting off the overhanging chocolate. And in the Christmas Pre-eve (23rd) rush I spotted this bargain - 20p sprouts!! - and two boxes of these new, updated, rebranded versions. At first I thought it was just a rebrand and new flavours but here we actually have things in the chocolate (texture!!) and much thicker choc to cope with that. And now with no added referring to food law! oh wait - that's an asterisk not a bullet point - indent your text better! As my bad picture suggests we have little minty pearls in the choc now (or hazelnut - we ate both). And look how thick that chocolate is! It does mean that you only get 6 instead of 9 in a box which feels misserable, but as I'd usually eat two normal Bahlsen at a time and for this one was fine so that's six visits to the box for £1.50 a box. Which isn't atrocious. And it's Bahlsen so you already know they are good - to use one of my favourite phrases they are present grade. The two versions are very different too. The mint one is a sweet after dinner kind of affair, where as the hazelnut one is much earthier and has a hint of the nuttella about it. Both instant hits and part of a great range of treats. Maybe only for when you have visitors or they are on special offer, but still the great range of buttery biscuits with a tempting chocolate fringe we have all come to love, no matter what they are called. You can probably tell what your girlfriend thinks of your drinking habits when she jokingly brings you back a lager beer called Yellow Snow from a shopping trip. Cinabar has often commented that my stronger pale ales and some of my lagers in the past don't smell all that pleasant, however, I usually take no notice. This 4.2% Yellow Snow was produced by Direct Beers, in Derby. It mentions on the bottle that it was produced by a snowman that lives at the North Pole, or possibly by Santa's dog! Yellow Snow is a pale golden Bavarian style lager beer, and was brewed using a secret blend of Continental hop varieties. It seems a shame to open and drink this lager now, due to the fact that residual yeast has been left in the bottle to preserve and mature the lager, otherwise known as Bottle Conditioning. I have a habit of keeping hold of beers like this right up until the Best Before Date for the fullest most mature flavour, which in this case was November 2020. However, Cinabar has only found two Christmas beers for me to blog about this year. Well, three Christmas beers if you count the wheat beer I drank by "mistake" last week. On opening this Yellow Snow admittedly it didn't smell all that great! I had to give it a good sniff too, as the hops and barley malt in the brew didn't exactly jump out of the bottle and give off their usual mixture of heavy scents. I immediately regretted opening the bottle and wished I'd left it for a year or so. The last beer of this kind I drank I left right up until the end date. That smelt and tasted terrific. This beer could be a little young, like when they deliver a bunch of green bananas on the supermarket delivery van… Gosh that frustrates me! There was a joyous fizziness to this golden beer on pouring a little Yellow Snow into my waiting beer glass. I resorted to proper beer sniffing by pouring almost half a pint and giving it a good hard whiff. There was indeed fruity hops here followed by sweet barley malt. I began to feel better. On taste this is a complex lager. There is a bitter start to this beer with battling herbaceous and fruity hops followed by sweet barley malt, and a touch of yeastiness into the aftertaste. For a young bottle-fermenting lager this Yellow Snow packs a punch, but I think they should call it something serious and order drinkers to keep hold of it for the duration. Wow, November 2020 would be a grand month to drink in! There is a lesson here as well, you shouldn't always avoid Yellow Snow! We are into the home stretch - can I do the last few videos on time too?! I’ve been to Waitrose a few times this month trying to find the other new Wakers crisps flavours that have been released this year, but there has been a continuous empty spot next to the Brussels sprouts ones which weirdly don’t seem to have sold out. 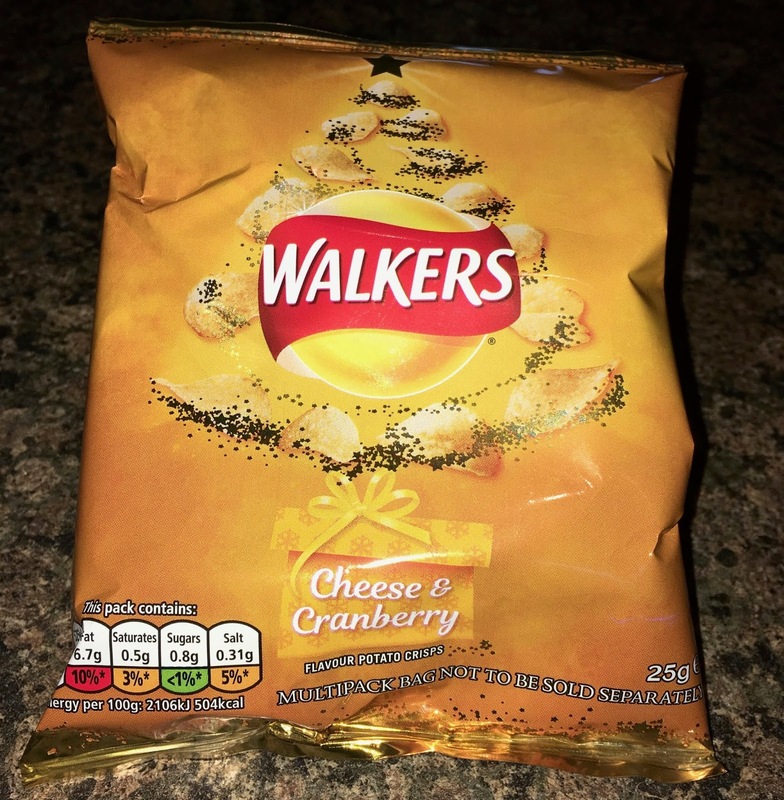 Asda online was the same, but this year we also had an Ocado order, and I was lucky enough to find these new seasonal Walkers Cheese and Cranberry Crisps. The bag is a pale orange in colour, but still has the Walkers Christmas tree on the front to give them a Christmas spin. We certainly love a cheese beard at this time of year so I think the flavour has good theming. 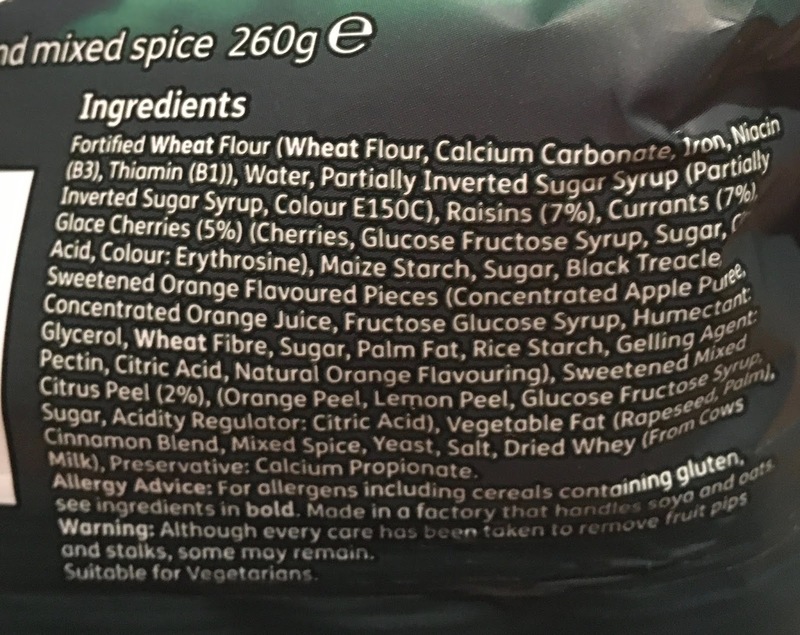 I opened up the bag of Walkers Cheese and Cranberry Crisps and could smell the cheese immediately, I actually thought they might be a bit strong. I poured them out to have with a sandwich. When I tucked in the cheese wasn’t too bad at all in strength, it was balanced nicely by the cranberry that added a good sweet fruitiness to the flavour. There was some salt too which left the flavour hanging on the taste buds until the next bite. Ultimately these Walkers Cheese and Cranberry Crisps are a more subtle Christmas themed crisps, but are done really well. I think if you like cheese flavoured crisps the addition of the cranberry really enhances that flavour. Fruity and cheesy, like those lovely blocks of Wensleydale packed with cranberries you get at this time of year. Here is hoping I can get a few more bags before the end of the year. We are in the home stretch now!! Now even I realise that this one is nonsense. 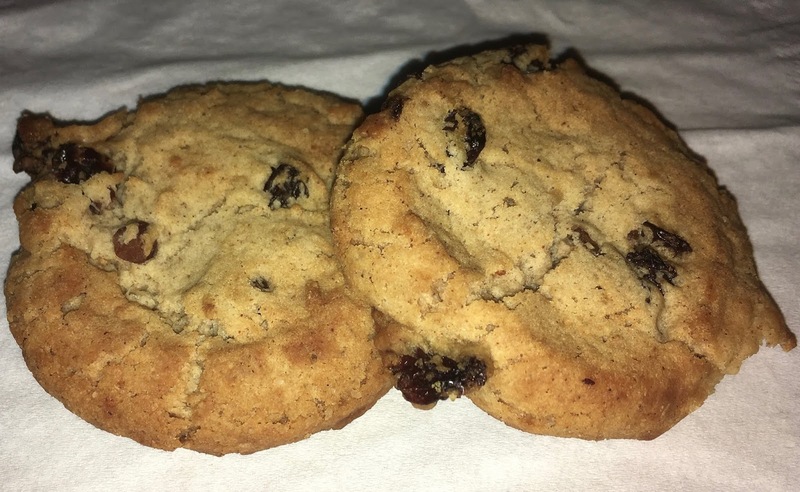 24 delicious bites of plant based protein, for this Alpha male stag and his female companion to eat. Because obviously grazing animals spend their day eating protein... I’d have probably picked this up for the videos if I’d seen it earlier (or it was 50p now) but it’s proof of us reaching peak advent calendar. They even have tack Christmas jumpers on. If you want something to put in a time capsule that says This Is 2018 then pop this in and you are sorted. Honestly. Now - if this was a leafy green advent calendar, where we ate some veggies comprising of amino acids - which our bodies then converted into useful proteins then we might be talking. That’s what grazing animals do. Heck - that’s what we do - humans don’t use the protein we consume we actively spend energy to break it down into the amino acids we could have just eaten in the first place. It’s almost like they found out how to sell Weight Watchers style fad crap that won’t work to a masculine audience. This? This is better. Take a jammie dodger, make it in a Christmas mold, and print a Christmas Pudding on it. Make the biscuit chocolate shortbread and fill it with orange jam, like something Heston might create. Brilliant, simple, Christmas. The shortbread people made these but I forgot to take a picture of the box so I’ll have to buy more. Present grade, no shame at all in handing these out to the people who aren’t keen on endless mince pies. Heck - they will almost certainly ask where they were from. I need more of this and less creepy deer. My lifelong love for fruit loaf is no secret, ever since I had it in my lunchbox as a child. 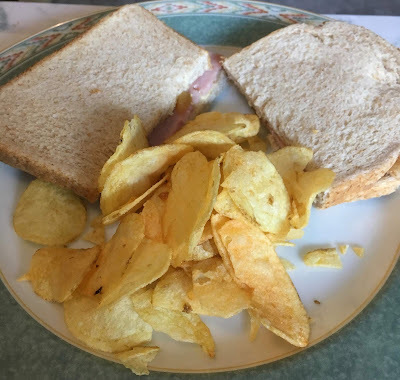 I used to have a couple of slices which were buttered and had slowly stuck together during the morning at school lunchtime. It was almost impossible to prize the two halves apart and one would always come away with all the butter on it, leaving the other slice forlorn. Fruit loaf is full of flavour, super squidgy and goes great sliced with thick spread butter, and washed down with a good cup of tea. I've tried the amusing sliced version where some machine or person slices the whole fruit loaf in one go, packages it, and then over time in the packet the fruit loaf glues itself back together so the person who opens it has to re-slice it all over again. This Soreen Winter Spice Festive Fruit Loaf has a mix of raisins, currants, zesty orange and lemon, cherries and mixed spice to warm us up in the winter months. It's very wet and windy at the moment, so I'm hoping this sliced and buttered for pudding will do the trick. I've been known to eat a whole fruit loaf on my own after a meal, but unfortunately I have to share this one. 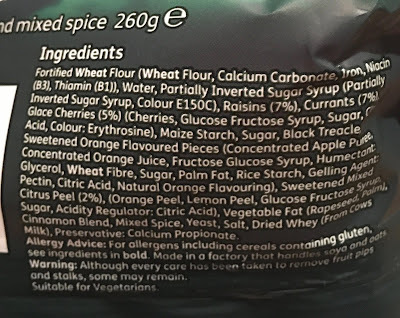 On opening the packet the Soreen Winter Spice Festive Fruit Loaf looked much like a usual Soreen Fruit Loaf, but as you can see from the photograph, once cut into slices there was a lot more of the ingredients on show. 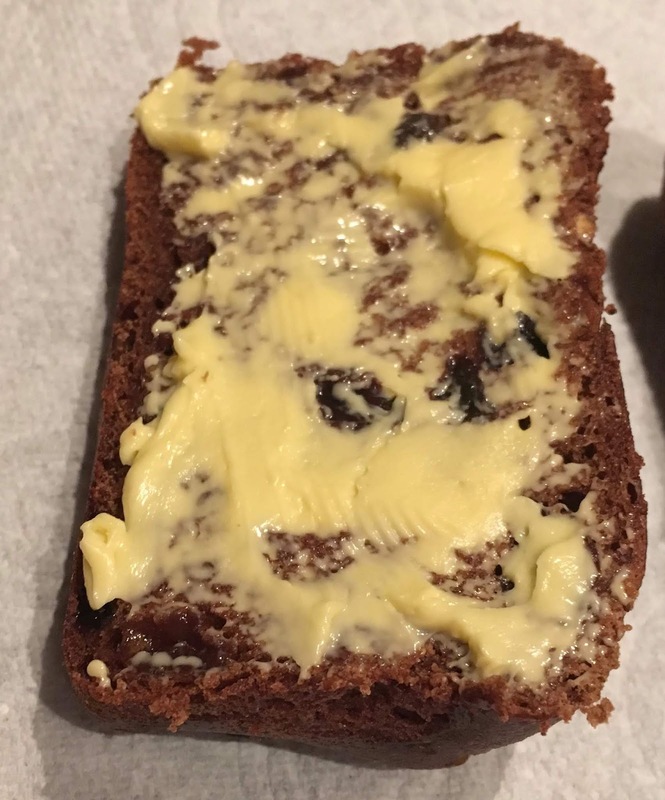 Once butter had been spread liberally on each slice, the Winter Spice Festive Fruit Loaf tasted like a cross between a fruit loaf, a fruit cake and a Christmas fruit cake. The added cinnamon in the Fruit Loaf made it all that more Christmassy. 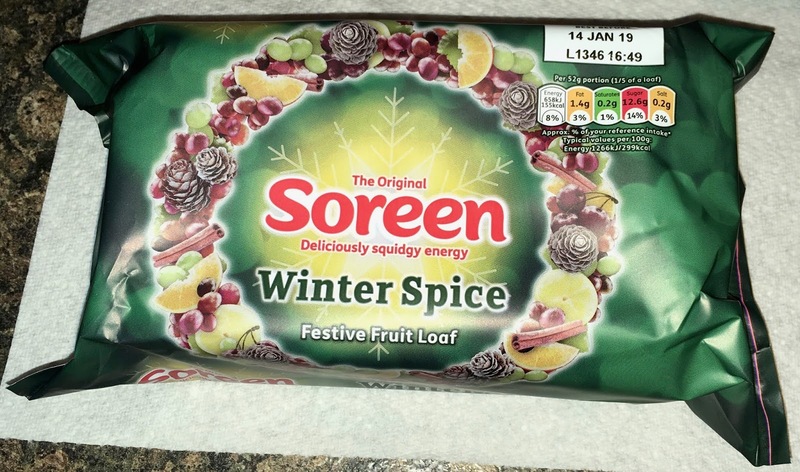 This Soreen Winter Spice Festive Fruit Loaf was really tasty. There was plenty of fruitiness, plenty of zest from the orange and lemon peals, a good deal of spice, and I even didn't mind the cherries, which I usually don't like asides in fruit cakes! It certainly had a wintery and Christmassy feel to it. The 260g fruit loaf contains 155 calories per 52g portion, with 1.4g of fat, 12.6g of sugar, and 0.2g of salt. Please see photograph for the ingredients. I think if you make crisps for your living the most obvious Christmas seasonal flavour has to be Turkey and Stuffing, and as such I have tried many different brands attempts at the flavour over the years. I have to say they are mostly positive reviews, as I do like meaty crisps. 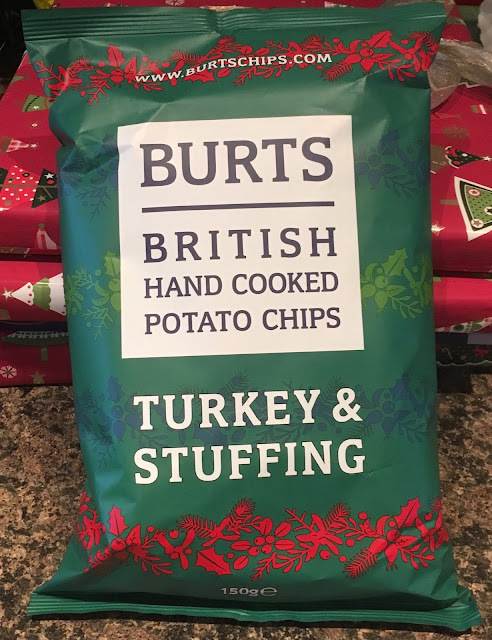 I was in Aldi and I spotted these Burts Turkey and Stuffing Crisps and found myself thinking I would give them a go anyway, and that they were another variety to test out. We had a busy morning and sat down to some sandwiches at lunchtime and I cracked open the bag. First impressions were impressive, these crisps had a lovely aroma and smelt rich and meaty. The crisps themselves were medium cut, and the texture was crunchy and about right for me. The flavour worked a treat, they are essentially chicken like in the meaty element but the stuffing is where the magic was, there were just so many lovely herbs mixed in. The sage stood out though, and I loved the flavours with the turkey, and was licking my lips with every bite. Ok this might be an obvious choice of flavour for this time of year, but I think this is my favourite version of it to date. I’m going back to Aldi for some more! More calendars and more cats! I went Christmas shopping on Saturday and Wolverhampton city had gone all out setting up a Victorian market and fair. The weather fought back, and delivered heavy rain and wind, such a shame. I did feel for all the store holders, but still managed to pick up a few items for gifts, but I was drenched and cold by the end of it. The hood on my rain coat kept catching in the breeze and my hair well I could feel the frizz springing into action. I decided to warm up in Costa and see if there was anything on their winter menu I hadn’t yet tried. I was thinking soothing and I was also thinking hot chocolate, but my eyes were drawn to Hot Caramel. A curious idea, and it sounded like just what I needed. This drink only comes in a small size, which makes sense when you try it as it is very sweet. It has a lovely taste, somewhere between butterscotch and liquid custard. The texture isn’t too thick though, it is easy to drink but I was content by the end of my cup. Any more would have been too rich. It was the perfect pick me up after my shopping in what was traditional British weather, and once warmed up I headed back out. This is a lovely alternative to a hot chocolate, and perfect for a cold day. 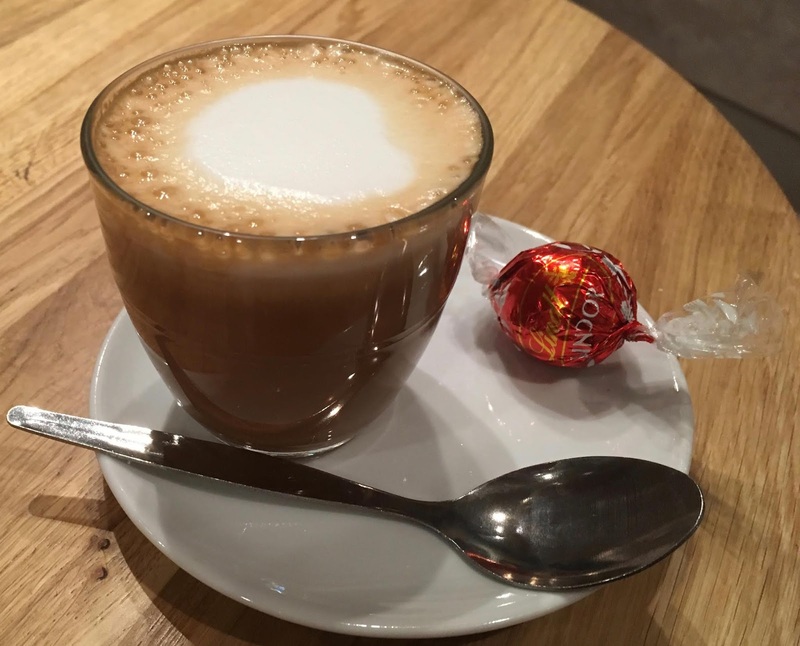 As a chocoholic I added a Lindt Lindor truffle to the side just for good measure, this probably wasn’t needed, but Christmas shopping is hard work! In the post Dec 1st sales I managed to get a lovely religious themed calendar for 50p instead of £6.99 - complete with festive story book. As I first opened it on the 11th Dec here are the first 10 days. I tried doing it by candlelight at first but it was very hard to read, so the candle is mostly there for atmosphere. Some more door opening action for those following along at home. A short late post for those following our advent adventures. So what can I say about Wholesome Stout? Admittedly it's not the most interesting name the Wye Valley Brewery, in Herefordshire, could have come up with. I don't want to sound pretentious (although I probably do), but I almost didn't write about this stout because of its name. It just sounds like something that's been mass produced, quick as you like it, off the shelf or something like that. Not that mass produced stout isn't any good or anything. I have a Guinness every time I have a big steak meal, whether it's at home or in a restaurant (and trust me, I rarely eat anything else in restaurants). Ignoring the front label and it's quite frankly dull name and having a read of the back and the Wye Brewery sell this Wholesome Stout like nobody's business. However, it's the front of the bottle and the eye-catching name that often sells a beer from all the others lined up by the shelf load in every supermarket. I know there's plenty of chocolate and coffee stouts out there, but at least they make me think; "Oh, interesting…" Perhaps Wye Brewery put all their efforts into brewing this Wholesome Stout, rather than coming up with a classic name as the back of the label eludes to? On opening this 4.6% volume Wholesome Stout, there was initially an usually strong smell of herbal hops, followed by a little sweetness from the malted barley. Then there were undertones of malted chocolate barley and that roasted coffee aroma that often comes with it. The sheer amount of flavours just in this Wholesome Stout's smell made me stand back and think. The name of this stout clearly understates it. This stout pours like a deep black hole in a pint glass. And there is that "Mmm…" on first taste. There is an initial herbaceous hoppy bitterness from the Northdown hops to this beer that almost instantly mixes with the menagerie of malted barleys. I could taste them all jumbling playfully over my palate. There is pale malt here, flaked barley, roasted barley, the sweetness from the crystal malt, and lip-smacking chocolate malt followed by that classic roasted coffee flavour. I've certainly learned something here. Never be put off by a boring name like Wholesome Stout, as it can often do what it says on the label! I have no doubt in Mr Kipling’s ability to make tasty cake slices, but these Mr Kipling Candy Cane Slices have confused me. Candy Cane’s have two significant identifiable elements, one they are cane shaped, and two they taste of peppermint. These two signifiant factors are not included in the new Raspberry and Vanilla Candy cane slices. 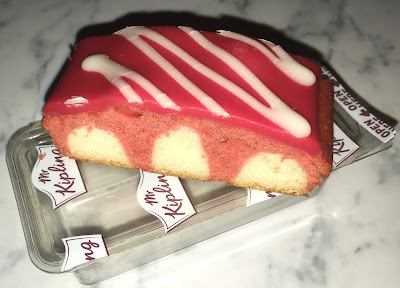 There is some striped icing, but at Mr Kipling’s cake’s usually have striped icing this isn’t especially new or special. 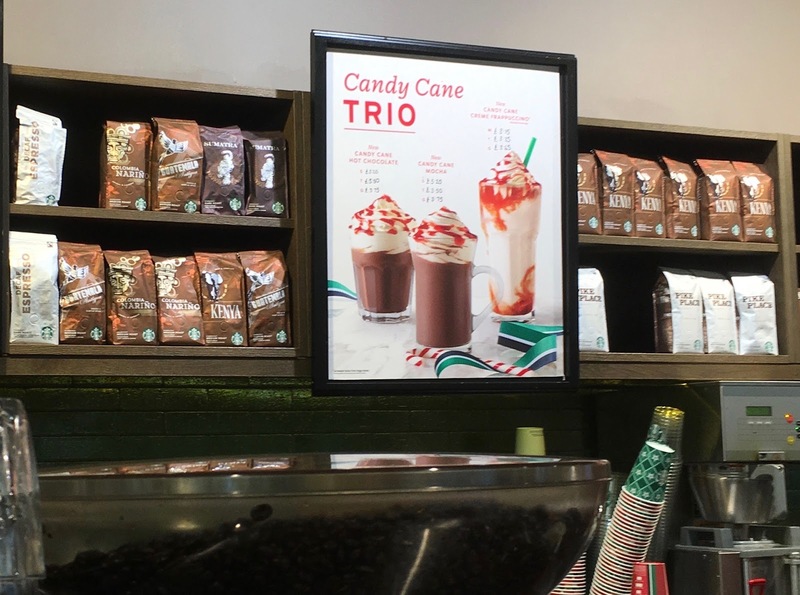 As a Christmas tie in product, having some linking to the minty candy cane on the tree would have been nice, especially as they went with Candy Cane in the name. I can’t quite get passed it to be honest. I did like the fact that these are individually wrapped cakes and as such they all stay fresh if you only want one, it also means that they can go into my lunch box for work and can be a treat at this time of year. The icing is soft and the sponge fluffy, there is a raspberry taste but it isn’t too strong. The cake flavour is still very much present, emphases with the vanilla, and they are tasty. As I stated I don’t think I’ve had a bad cake slice from Mr Kipling. Based on flavour and decoration alone these get their usual top marks. However as a Christmas tie in to candy canes I can’t really award many points at all. It is an opportunity lost, I would love to give some minty flavoured cakes a try, perhaps with a cute candy cane design on the icing? Just a quick one to talk about a lovely little new range that has appeared from Rubicon. This is the Nimbu Pani flavour which is basically minty and lemony. This one is really refreshing and something I’d have again, I think it would work well as a base for a cocktail. More fun with advent calendars! 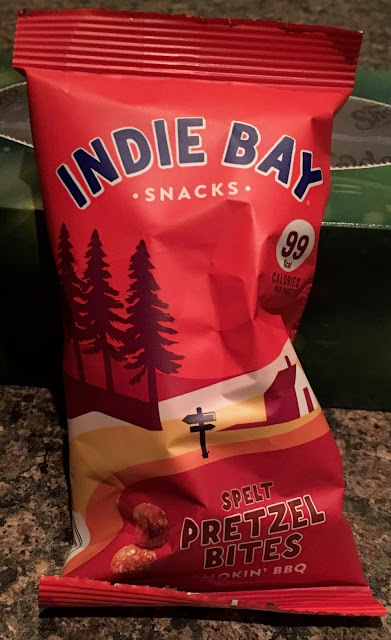 Always on the lookout for alternatives to nuts and crisps, these Spelt Pretzel Bites Smokin' BBQ from Indie Bay seemed to fit the bill. There was a lot of information on the little packet. For instance these spelt and wheat pretzel bites are an all natural source of fibre and protein, being GMO (genetically modified) free, they have no trans fats (so good for your heart) and are vegan friendly. Vegans are pretty strict, I'm slowly learning, so it should mean that definitely no animals were even slightly put out of sorts during the production of these pretzel bites! On opening these Spelt Pretzel Bites Smokin' BBQ had a pretty smoky sweet barbecue smell to them. As you can see from the photograph, they were spherical balls around one centimetre in diameter. The bag was a good shape for tipping as many pretzel balls into my mouth as possible, so these would be good for a gaming snack between death-matches or Battle Royale or races or whatever you may like to play. They do taste of a smoky salty sweet barbecue sauce to start with, until you bite in and then they taste of pretzels, with a touch of onion, garlic and paprika in the aftertaste. They can be a little dry whilst eating, so I would recommend some sort of beverage be close at hand, or alternatively one of those beer hats if you have one! I just filled my beer mug with a dark ruby ale to wash them down with. They went very well together! The 26g bag contains 99 calories, with 1.2g of fat, 1.2g of sugar, and 0.6g of salt. Please see photograph for ingredients. Today I remembered to read out the story from the book that came with the new advent calendar. There is a lot less of it than I expected! Behold - a new calendar approaches! I found a more religious advent calendar on sale for 50p instead of £7 and added it to the burden. We have had a few mince pies as treats already this year, and always have a box in the cupboard for seasonal emergencies; ie the idea of something christmassy on the telly and a need for something to snack on whilst watching it. 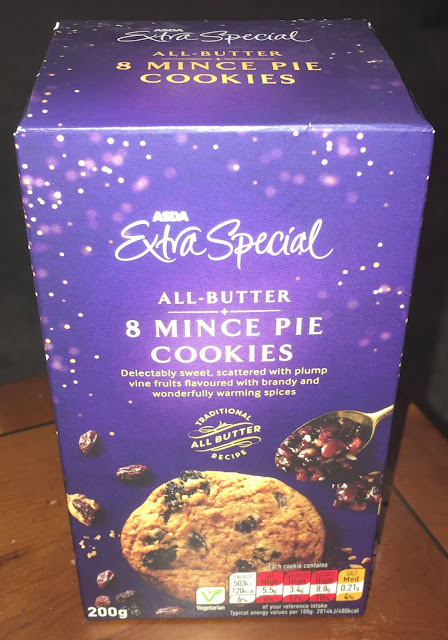 Asda have taken all the wonderful flavours of the mince pie and turned them into a cookie combination. These Extra Special Mince Pie Cookies are technically dunk-able mince pies, or as close as you would want to get before it gets messy. Christmas is all about the pizza. Well I think I meant that the other way around, this pizza is all about Christmas. It might not be the most obvious pairing, but top a pizza with turkey, bacon, some stuffing and a drizzle of cranberry sauce and how can you not be on to a winner. 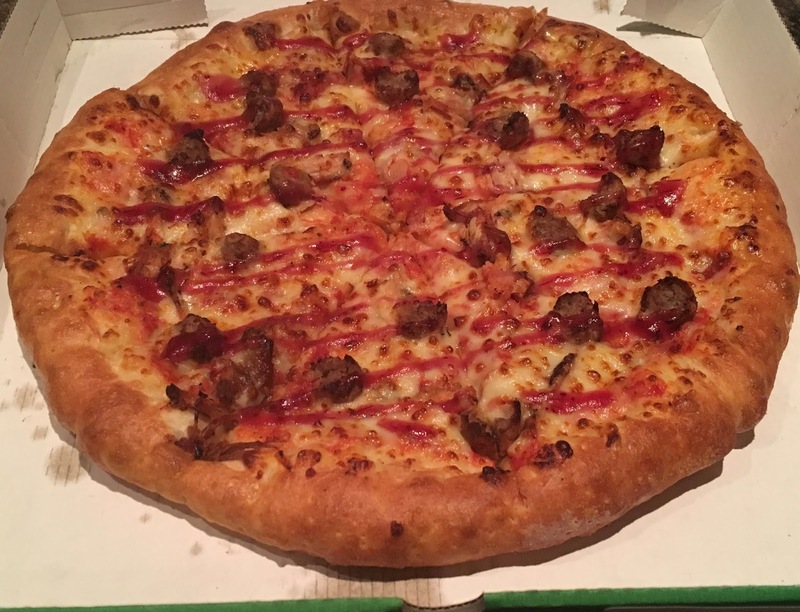 I am a big fan of cheese in general but I wasn’t sure how that would go with turkey, but putting this aside I ordered the pizza as a stuffed crust too! 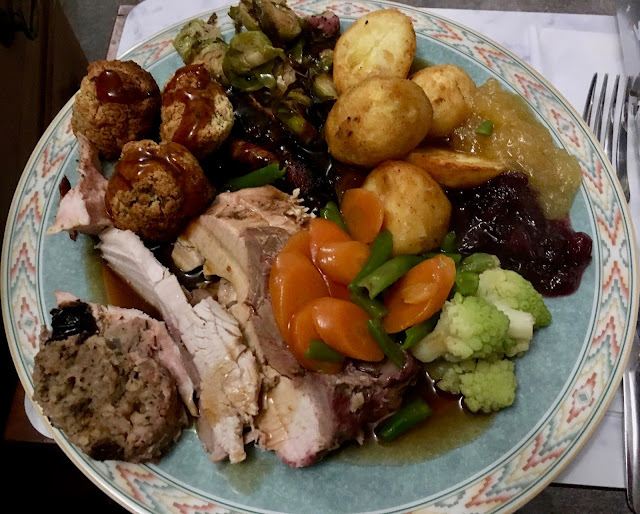 I have to admit it did work rather well, the stuffing flavour was mainly sage and added a good herby taste, similar to that of a heavily seasoned sausage. The turkey pieces were meaty and flavoursome and there was plenty of topping. 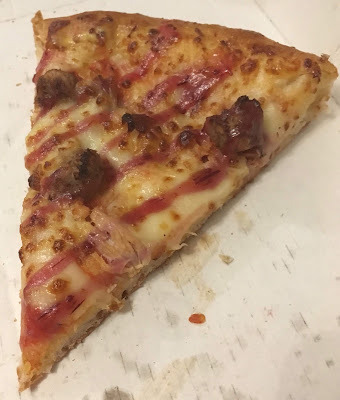 The cranberry sauce was a nice different touch too, the flavour was sweet but also sharp, and this brought the whole pizza together, as it worked well with the cheese and the meaty tastes. I enjoyed dipping the stuffed crust into the pot of garlic sauce that came with it too, there aren’t any calories at Christmas right? One thing is for sure though this pizza won’t be on the menu for long, so I need to work in another order into my schedule before it has gone and Christmas has arrived. Turkey, cheese and cranberry turns out to be a winning combination! Another Monday, another set of doors to be unlocked. What will we find! A short while ago, the lab I work for rebranded and sent out three cloves of garlic to everyone that wanted them to try their hand in the Garlic Challenge. For your typical non gardener the challenge is actually putting the garlic into the ground - and in this aspect I have succeeded! Granted, I've just missed out on a lot of the unseasonal warmness, and light showers, but there's plenty more to come (It's Only Four Degrees etc...)! As interesting as it would be to fill this with pictures of my garden I figured that it would make a nice three part video as the garlic grows (or more likely my cats dig up and desecrate the pots) and take us neatly into spring - so here is part one! Mulch from our compost heap that is basically all avocado skins and left over leafy greens. Three pots, three cloves, 6 months to grow. Lets see what happens!